The literary creations of both Cervantes and Shakespeare as illustrated in Japanese Manga/Graphic Novel style are celebrated in a month-long exhibit, April 4 – May 4, at Texas A&M International University’s (TAMIU) Sue & Radcliffe Killam Library’s Special Collections and Archives, room 203. 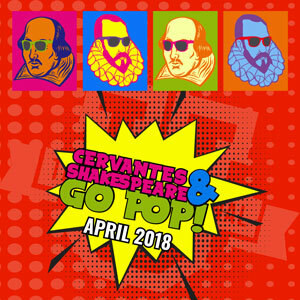 The exhibit, “Literary Masters in Manga,” is part of TAMIUs’ month-long “Cervantes & Shakespeare Go Pop! Festival. Admission during hours of operation is free of charge and open to the public. Reference/Special Collections librarian Jeanette Hatcher, who curated the exhibit, said it captures the broad expanse of Magna and the beautiful illustrations at its core. “This is an exhibit that is book-based, featuring 24 novels in the Japanese Manga/graphic novel literary style, English language text -- all based on the works of Shakespeare and Cervantes. Some are a retelling of the story, including modern language and present-day locations, while several use original dialogue and classic settings. Additionally, there are a few that mix and match characteristics such as modern language and old settings or old language and modern settings. All have beautiful illustrations that are at the core of Manga, and the artwork holds the reader’s attention,” Hatcher explained. Hatcher noted that Manga is popular worldwide and has introduced millions to Asian art and literature. “With the advent of the internet, graphic novels, Manga, as well as the more familiar Japanese anime, began to play a big part in modern pop culture. Manga has introduced millions of young people around the world to Asian art and literature. It’s very popular among the under-25 population. It’s an engaging format that makes for easier comprehension of literary classics, which may seem distant to many young readers. Manga also bridges a cultural gap by sparking interest in Asian culture. In fact, this exhibit is also part of the University’s celebration of Asian Pacific American Heritage Month,” she said. In curating the exhibit, Hatcher said she worked to included multiple versions of entries. 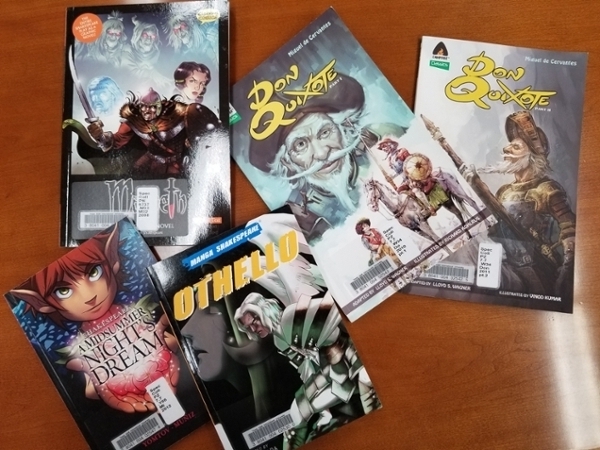 “I selected the items as good examples of the graphic novel literary genre, and also selected multiple versions of the same play to illustrate different ways a story could be told, Manga style. Included are Don Quixote, Othello, Hamlet, Macbeth, Romeo and Juliet, Julius Cesar, Much Ado About Nothing, A Midsummer Night’s Dream, As You Like It, The Merchant of Venice, King Lear, The Tempest, and Henry V,” she concluded. The exhibit will be available for viewing April 4 – May 4 in the Special Collections & Archives Reading Room in KL 203. The exhibit can be seen during Special Collections & Archives regular operating hours. For additional information, contact Hatcher at jhatcher@tamiu.edu, phone 956.326-2404, or visit offices in the Killam Library, room 203. Additional information is available from the TAMIU Office of Public Relations, Marketing and Information Services at 956.326.2180, prmis@tamiu.edu, online at tamiu.edu, or on the University’s social media channels: Facebook, Instagram, Twitter and YouTube.